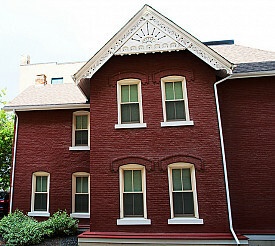 Thinking about painting your brick house? Think again ... and even a third time. While coating brick walls with a shade of sunny yellow or crisp white will certainly brighten the appearance of your property, you may be dismayed to find that it's not easy to paint brickwork with a professional touch, and it will sharply increase the amount of maintenance your home's exterior requires. Read all about the advantages of unpainted brick, as well as alternative ways to give your outside walls a fresher, more modem look without painting. Low Maintenance. Unpainted brick is surprisingly low maintenance. It's durable and doesn't peel or bubble, even in harsh weather; in fact, its "built-in" color actually develops an attractive patina as it ages. Once you put that paintbrush to the surface, however, you're committing yourself to regular repainting. Even if the idea doesn't faze you, think of its impact on curb appeal. When you eventually put your home on the market, many potential buyers will be turned off by the prospect of all that upkeep. Weather Resistance. Another advantage to just leaving your house exterior alone is the fact that bricks are made from a kiln-fired mixture of clay and shale, which is naturally porous. This quality allows brick walls to breathe, expelling moisture as your home goes through rainstorms or freeze-thaw cycles. Painting, unless meticulously done with high quality, vapor-permeable masonry paint, tends to trap dampness and cause your bricks to crumble, often in as short a period as 5-10 years. The deterioration will be hidden beneath the paint, making it difficult to spot -- and treat -- in the early stages. Difficulty of Paint Removal. If you do go ahead and paint your home's outside brickwork, remember that you will be making a serious commitment. Should you change your mind, paint removal is costly and time-consuming. The necessary chemical treatments or sandblasting are very likely to damage the brick in the process. Are your brick walls looking unbearably dingy and drab? Why not try one of these alternatives to painting? It will be a lot less problematic in the long run. Refresh the appearance of your exterior brick by pressure washing to remove dust and grime buildup. Do brighten up your home with paint ... the trick is, just don't use it on the brick itself, but rather hire a professional painter to redo the trim, doors, and shutters. Opt for traditional snowy white, match the mortar, or pick up one of the subtle shades in the brick. To achieve a unique effect, experiment with a contrasting pastel, for example a soft aqua or primrose. Add attractive and practical exterior light fixtures, either electrical or solar powered, to brighten up your property. Plant shrubs and flower beds adjacent to your home. They will soften the effect of a brick color you really do not care for. Or hang window boxes overflowing with lush green foliage. Repoint the mortar. This is important not only for good looks but also to block moisture and critters from getting into your house. Apply a special finish such as lime wash or stain that will subtly change the color of your brick, while still allowing it to breathe.